In addition to supporting Broad Ripple’s sustainability goals, Enterprise offers local residents a variety of sustainable mobility options that extend beyond day-to-day car rental. Enterprise Rent-A-Car opened a new 1,125-square-foot office in Indianapolis’ historic Broad Ripple Village neighborhood, making it the 36th location in the Indianapolis metro area and the first full-service rental car provider in the historic cultural district. Enterprise Holdings’ portfolio – which also includes the National Car Rental and Alamo Rent A Car brands – handles more than 70 million transactions worldwide and covers more than 9,900 fully staffed neighborhood and airport offices in more than 90 countries and territories. There are now 86 Enterprise, National, and Alamo locations – staffed by more than 1,200 employees – operating in Indiana alone. Enterprise’s newly built Broad Ripple office supports the company’s energy and construction initiatives. It features LED lighting and signage, white reflective roofing, and extra insulation to reduce heating and cooling usage and utility costs, as well as a recycling system for wash bays. 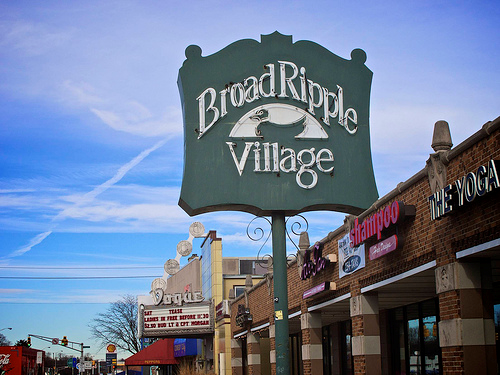 These sustainability measures also align with Broad Ripple’s commitment to “Reduce-Reuse-Recycle” practices and its development of a neighborhood “Town Plan” that focuses on a more sustainable future. In addition to supporting Broad Ripple’s sustainability goals, Enterprise offers local residents a variety of sustainable mobility options that extend beyond day-to-day car rental. By providing customers convenient and affordable access to late-model, fuel-efficient vehicles, local car rental reduces the number of vehicles on the road, and in some cases, eliminates the need for personal ownership – making it one of the most effective and sustainable mobility options today. Furthermore, Enterprise Rideshare, a service of Enterprise Rent-A-Car, is an alternative commuting solution that has become one of the largest vanpool operations in the nation. The service has been going strong in Indianapolis for the last five years, growing from just two vans to nearly 50 in the Indianapolis market. Every business day, Enterprise Rideshare takes more than 100,000 individual cars off the road, eliminating more than 2.4 billion commuter miles driven each year and eradicating the need for 100,000 parking spaces. Additionally, almost 2 billion pounds of carbon emissions are reduced through Enterprise’s commuting programs. In addition, the Enterprise Holdings Indiana subsidiary has earned seven Jack Taylor Founding Values Awards, one of the company’s highest honors – in 2004, 2011, 2012, 2013, 2015, 2016, and 2017. The award not only recognizes outstanding business achievements, but also focuses on such areas as philanthropy, environmental impact, diversity, and business ethics.